While a lot of attention has been given to the bandwidth battles in the cruise industry, it is easy to forget that merchant maritime is the bread and butter of the maritime satcom market. With all facets of the market looking to improve operations, adding more digitalization and automation into their operations, the need for connectivity is only increasing. Along with this digitalization comes additional challenges – remote IT assets that need to be monitored and updated, data which needs to be processed, and (most notably) cyber-security concerns which must be addressed and continuously updated. All told, and the merchant market is a key source of revenues for the satellite sector, and one which is going to require more than just a big pipe. According to NSR’s Maritime SATCOM Markets, 6th Edition, there will be 32,000 broadband enabled merchant ships coming online over the next ten years. 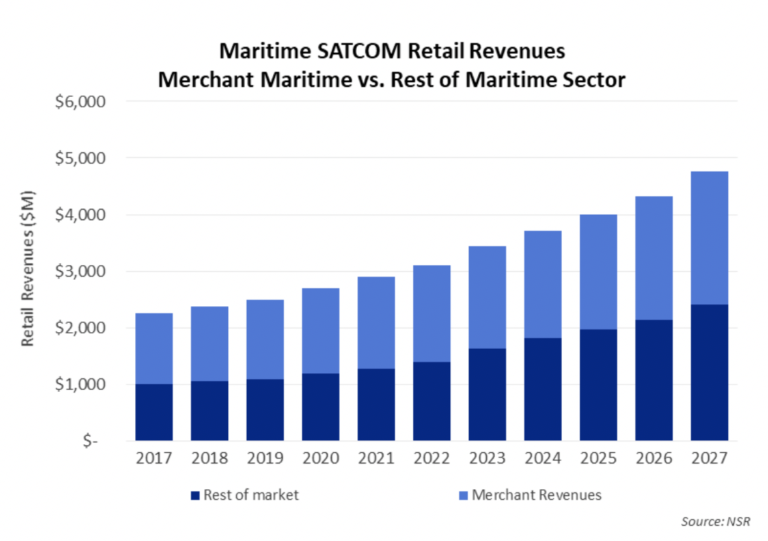 By 2027, nearly $1 out of every $2 dollars spent on maritime satellite connectivity will come from the merchant sector. With 50% of the maritime satcom market share, service providers are focusing heavily on competing and winning business in this sector. End-users themselves are requiring more sophisticated networks with every generation. Already, the migration from MSS connectivity to VSAT is an established trend – where customers look for the predictable bills and higher throughputs which VSAT can enable. Although the introduction of Iridium’s Certus system is breathing some life into this segment, the race for primary connectivity is heavily leaning towards VSAT. Within VSAT, the battle is between the various, mostly similar looking, offerings from service providers. Using a combination of frequencies and satellite architectures (C-band, Ku-band or Ka-band, FSS or HTS), they all largely deliver a similar technical connectivity experience to the vessel. So, how are service providers competing against each other when their core products are fairly closely aligned? Price, flexibility, and value-added services are the core differentiating factors. We are seeing an increasing emphasis on “zero-down” style monthly plans such as KVH’s Agile Plans, with terminal prices wrapped into the monthly service cost, requiring limited upfront commitments on the part of merchant end-users. In an era of increasingly tight budgets, reducing some of the friction points around terminal costs can become a key decision point. As the industry starts another year of waiting for the arrival of the “golden terminal” that offers the winning combination of form-factor, price, and throughput capabilities, changing the business models to match end-user spending preferences seems to be a common solution. Alongside shifting CAPEX investments to an OPEX flow, vessel operations are becoming increasingly more complex and digitized. That complexity is providing opportunities for service providers to add differentiation to their offerings and help boost revenue streams from the increasing pressures facing connectivity plays. Moreover, service providers are investing resources in creating packaged ‘off the shelf’ and ‘customized’ offerings to compete against each other as they truly become managed service providers in a greater sense of the term. Overall, market differentiation is increasingly shifting towards what else providers can bring to the table – not the speed of the pipe or the price of the connectivity alone. As the merchant maritime market gathers at SMM, end-users should not only be focused on the price of the raw connectivity, but what other problems connectivity providers can solve across their businesses. In today’s era of increasingly digitized and automated operations, connectivity is quickly becoming a core-function of ship operations. With that connectivity, brings a host of other IT challenges that connectivity providers are focusing on solving.